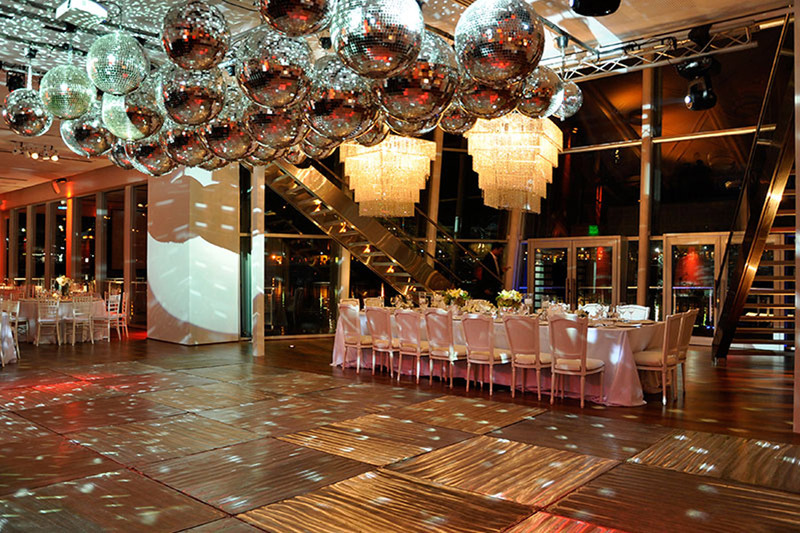 Immediately establishing itself as a Buenos Aires architectural icon, Madero Walk Eventos is a 96,875 sq. 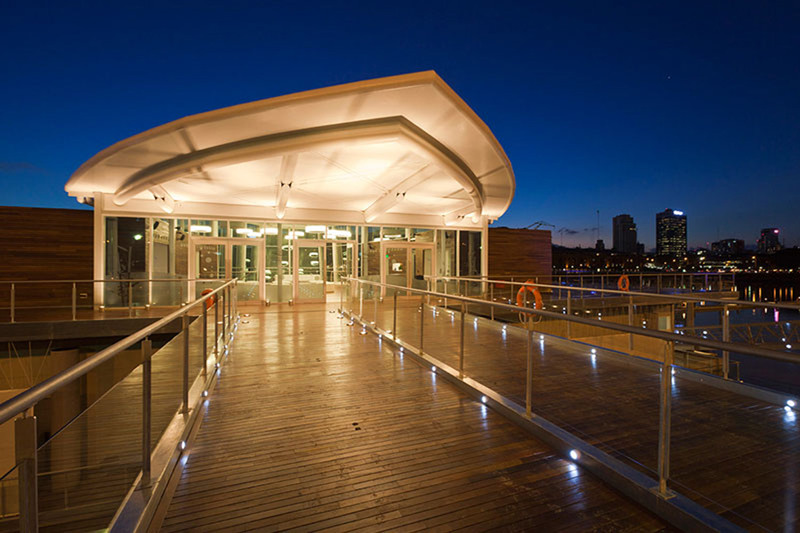 ft. multi-purpose event destination berthed at #1 Puerto Madero Dock on B.A.’s trendy waterfront. 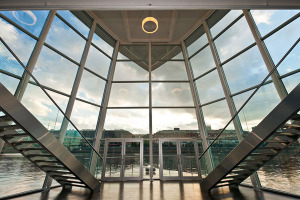 Opened in May 2013, this luxurious venue is designed to host private parties, weddings and a variety of corporate and social events. Featuring over 16,460 sq. ft. of ‘party’ surface, including two outdoor terraces with breathtaking harbor and city skyline views, this unique setting was envisioned by leading real estate developer Vizora, and designed by Bodas Miani Anger & Associates. 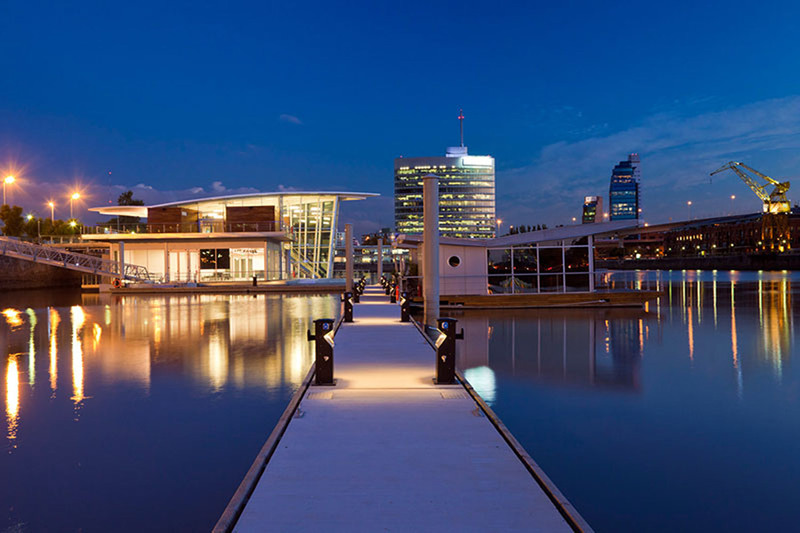 Two years in the making, Madero Walk is Latin America’s first floating ballroom. 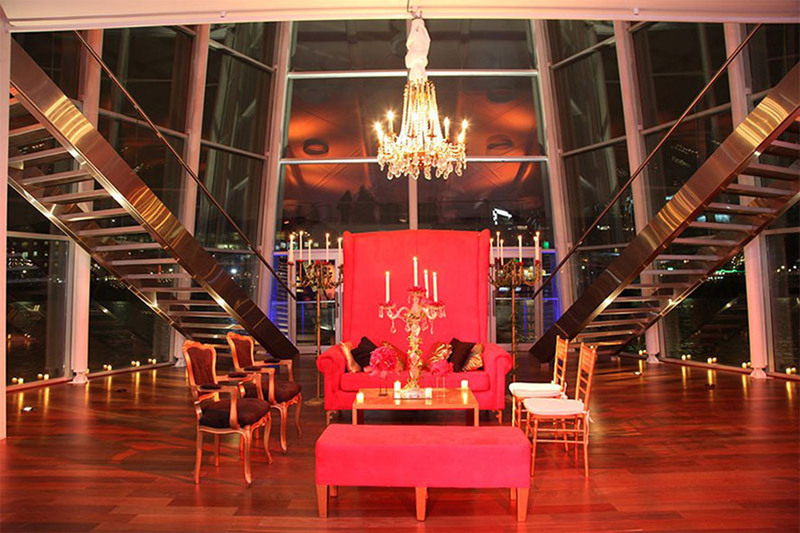 Representing a $4 million + investment, the sumptuous setting is designed to host three separate events simultaneously. 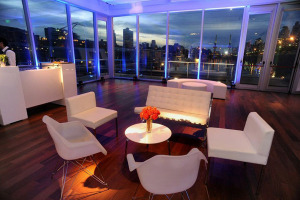 Providing discrete auditory isolation for small, medium or large-scale gatherings, seating as many as 450 attendees, or accommodating up to 600 party guests, required expert acoustic design. 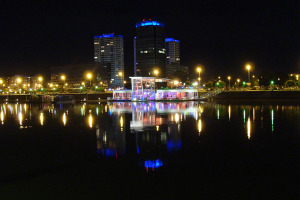 To assure clients that neighboring events would not audibly intrude upon each other, the developers reached out to WSDG. Drawing from a 40+year track record of resolving sound-related architectural issues, WSDG designer/acousticians devised solutions to enable the duplex complex to be constructed with absolute aural integrity, and eliminated the possibility of sound leakage. Engaging Electroacoustical simulations and sophisticated auralization techniques and predictive programs including: CattAcoustic ABEC 2 and 3 Insul, Winflag, and Bastian, WSDG devised a series of efficient, cost effective and aesthetically striking recommendations for this inimitable venue. Featuring panoramic 40’ high walls capped by a “floating” ceiling, the penthouse ballroom posed the most dramatic acoustic challenges. WSDG partner/project manager Sergio Molho reports that the rooms all glass walls were constructed of three layers of glass: a 4 mm. flush mounted against a 6 mm. separated by a 12mm. air lock and sealed by a second 12mm thick glass layer to enable the room to contain rock concert level audio up to 130 dBs. In addition to providing superior acoustics, the glass’s thermal properties contribute significantly to the efficiency of the HVAC system. WSDG also stipulated barrier screens for HVAC compressor sound suppression. Absorptive acoustical wall, and ceiling treatments and recording studio-quality interior wall construction, enable Madero Walk to isolate each of its three contiguous event sites. To further expand the venues’ flexibility, customized, moveable partition panels were installed in the main ballroom to divide it into three smaller but equally audibly unobtrusive neighboring party rooms. 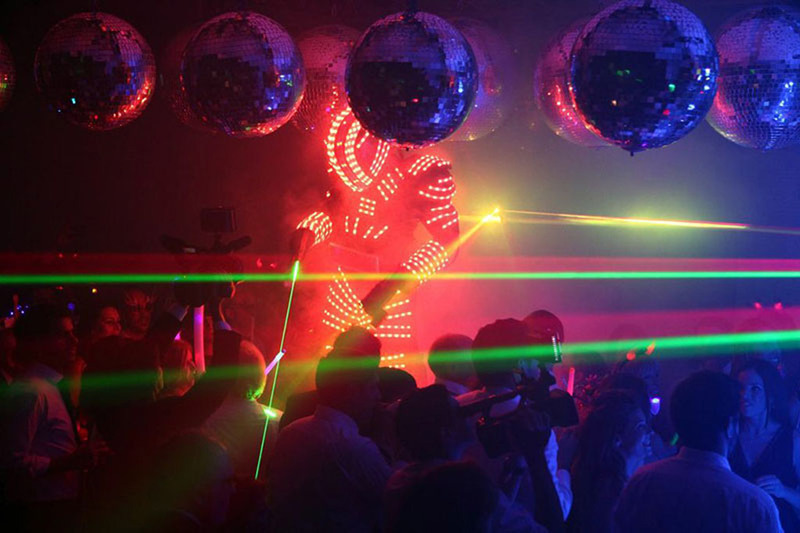 Thanks to its unique concept and captivating location Madero Walk Eventos has quickly established itself as a compelling addition to the Buenos Aires party and special event scene.